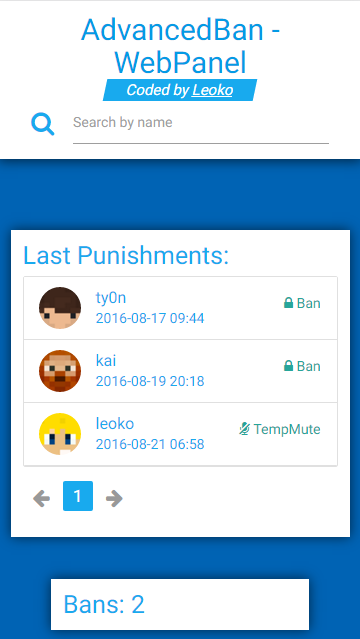 AdvancedBan is an All-In-One Punishment-System with warns, tempwarns, mutes, tempmutes, bans, tempbans, ipbans, tempipbans and kicks. the plugin has configurable Time & Message-Layouts which automatically calculate and increase the Punishment-Time for certain reasons. AdvancedBan provides also a full Message-File so you can change and translate all messages & a detailed config file with a lot of useful settings. This is a BungeeCord & Bukkit/Spigot-Plugin in one and it supports MySQL and a local embedded Database to provide high performance. 4. Check with /advancedban if the plugin is loaded. 5. Configure it like you want & have fun. See your own or a player's warnings. By default, the user will be able to punish an infinite amount of time if he has the perms to use the command. In the config, there is a section called "TempPerms". The amount is entered in SEC and if a player has more than one perms the higher numbers override. There is a second explanation in the config.yml. If you use this plugin on bungeecord you need to define the permissions in the config.yml of the Bungeecord Server or through a spcial bBungeecord Permission Plugin. 3: "kick %PLAYER% &c&oYou have received your 3rd warning!" 4: "tempban %PLAYER% 30m &c&oYou have received your 4th warning!" 5: "tempban %PLAYER% 5h &c&oYou have received your 5th warning!" 6: "tempban %PLAYER% 7d &c&oYou have received your 6th warning!" 7: "tempban %PLAYER% 1mo &c&oYou have received your %COUNT%th warning!" 10: "ban %PLAYER% &c&oYou have received your 10th warning!" Here you can change every message. All Message-Variables that are available are used in the default settings. Here you can define predefined reasons which can be used for (temp-)banning/muting/warning & kicking. You can use them by just typing @Layout-NAME instead of the reason. So you can have different layouts with different information for different reasons. And once you have defined them you do not have to type the whole reason. Here you can define timelayouts which can be used for temporary-punishments. You can use them by just typing #LAYOUT-NAME instead of the duration. The time increases every time a player gets punished with the same layout. # The default layouts are in the Message.yml file! - "&cIt seems like you are using a"
- "&chacked client please disabled it!" - "&cUnban in &8\xbb &7%DURATION%"
- "&eTS-Ip &8\xbb &c&ncoming soon"
- "&eForum &8\xbb &c&ncoming soon"
# You would use this time-layout for example like this: "/tempban Leoko #ExampleLayout Hacking in FFA"
# Or with "/tempwarn Leoko #ExampleLayout Advertising" or with "/tempwarn Leoko #ExampleLayout No capslock please"
# You can also combine this with MessageLayouts like "/tempban Leoko #ExampleLayout @Hacking"
If you have made one just send me the link per PM. The webpanel is not something to download like the first one. It's a website where you can register your server and the website will generate your own banpanel. Also the panel does only display things it is not for administration just for monitoring. This web interface does not include all features listed above, like the player-search or advanced mobile optimization. Finally please note that all credits of this web interface got to @mathhulk and that we won't provide any support for it. I don NOT vouch for the security of this web panel! The new Version of AdvancedBan was a lot of work for and I spend a lot of time and effort on it. eg. Player, Bit-System, MC-Version, Server-System ect. Joedon, rukzen, FreezyHD04 and 74 others like this. This plugin is just awesome. All messages are fully configurable. I recommend to set it up with a mysql database. I used to love this plugin, but its getting worst and worst. Players are getting timed out when they join. I reported this over a month ago and its still not fixed.. Seems great, on the surface. I needed assistance, so I joined the discord like this page says to do. I didn't receive support, neither did at least one other person. There's a team of people in the discord. Not a single one was helpful or useful. If you're going to tell people to ask for support someone - CHECK IT AND CHECK IT OFTEN. Oh, but what does Discord have to do with a plugin review? Well, how about the fact that I have an issue with the plugin that I needed an answer for. Thankfully the source is on Github and I was able to have my developer look at the source and answer my question. AdvancedBan does NOT allow you to change the commands, and it WILL stomp on back-end server ban systems if you're using it on Bungee. So do all your unbans or make sure you can do /plugin:unban before installing it on Bungee. Don't ask for support. You won't get any. Leoko may be active, but his team are idiots and won't respond. And if you @ anyone on DIscord, you get yelled at. So, there's that. Changing the source code is a pain in the rear as it's horribly written. But then most spigot plugins are. And this ends my REVIEW of AdvancedBan. Yes, there is a lack of support because I don't officially support this plugin myself anymore as I've begun to study and therefore don't have the time to do so. So it's up to some volunteers on the discord to help other people out. And they are doing great in my opinion. Yes it's not the perfect code and I'd definitely do some things differently now but all in all, to call it "horribly written" is just and complete overstatement and rude. 4 stars if players wouldn't be able to join when they are banned. Great config etc but the purpose of a ban plugin is to keep bad players banned and that doesn't work. Works like a charm for me. Great work! AdvancedBan is very well made in my opinion. Bug - After 150 entries in banlist it does not display any other bans in banlist. Also /check command need to wait 120 seconds to get an result. Owner of this plugin not responding to my bug. It was an good plugin, but now it is not anymore! Earlier versions does not work, not loading. Awesome plugin, but it would be more awesome, if the plugin could store, the player ips, so we can ipban offlineplayers!.